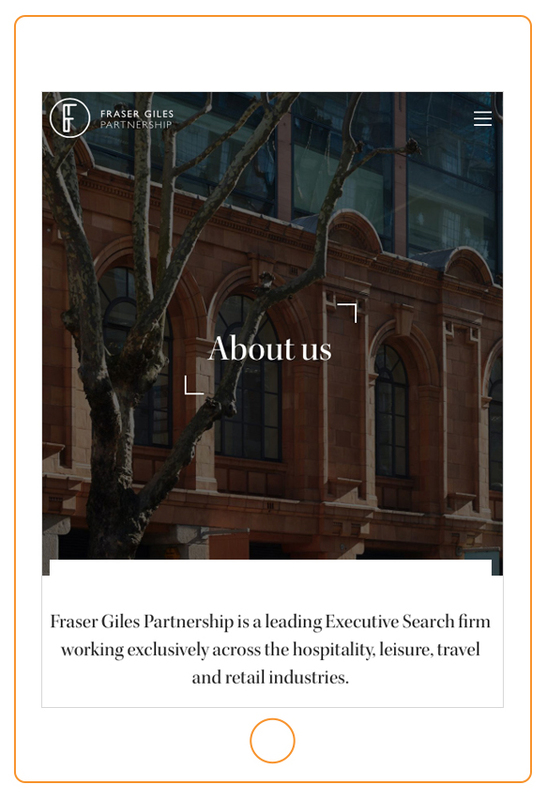 Over the past few months we have been working with executive search business Fraser Giles Partnership. With extensive expertise with the hospitality, retail, travel and leisure sectors, they spend their days finding the perfect people for the perfect roles. In fact for this particular design agency, they were the perfect client. It’s as though, enjoying a ‘good fit’ by instinct every day, they just knew. We began our work for Fraser Giles Partnership with a brief for a new website but that proved to be just the starting point for this project rather than the defining parameters. By the end of our work we will have effectively been rebranding an executive search firm – but in such a way that it enhances rather than departs from where they’ve been. There are so many fantastic aspects to this project, the primary one being just how creative it has been. Working with the more corporate end of business, that’s far from a given but when a client embraces doing something interesting, beautiful and different, the end result is significantly, incrementally better. Our work for Fraser Giles Partnership has ended up covering so many aspects of what we do: branding, print, photography and art direction as well as the primary brief in the first place, web design. Planning the digital part of this project was relatively straightforward – replacing a ‘single-page’ website with a more expansive format. Condensing all the work of a small business onto a long, multi-panel page can work really well. But for a more formal business like Fraser Giles Partnership it had come to give the impression of over-simplifying their work. Additionally, the company had no ‘visual aspect’ to their brand. I proposed working with our long-time collaborator, architectural photographer Alistair Nicholls. Over two sessions, we built Fraser Giles Partnership a comprehensive photography library which can now be used across every aspect of their brand including presentations and the company e-brochure. Every aspect of this project has been about retaining the elements of the brand that work and updating those that don’t. I very much admired the stylish and distinctive icon that had been designed for Fraser Giles before our involvement. However the Brandon Grotesque font that had been used was felt to no longer strike the right tone and that a more classic approach would be preferred. The amended Fraser Giles Partnership logo – we left the stylish icon, designed before our involvement, unchanged and following a client brief, added Gill Sans. With the direct brief to switch the type with Gill Sans, we used this comparatively simple change to define nearly every aspect of this project. The classic 1920s font struck, for me, the right tone for the brand and came to be something of a turning point in our approach. If what we were designing worked alongside Gill Sans, it was right for Fraser Giles. Building a new website without any visual material at all is one of the most challenging briefs out there. In this case, I saw an opportunity to use the core sectors of hospitality, leisure, travel and retail to create a photo library in a single visual style. This could in turn be a key part of how the brand was perceived overall. I have worked extensively with architectural photographer Alistair Nicholls over the years and proposed a collaboration that came to fruition over two shoots. Given Fraser Giles are based in Chelsea, we suggested a series of locations primarily around their offices but also further afield to capture every aspect of their work. Alistair and I ended up shooting in Brompton Cross, the backstreets of Chelsea, Sloane Square, Pimlico Road, as well as King’s Cross and St Pancras stations. The first shoot was at the peak of spring in mid-April, the second amid the summer heatwave in early July. 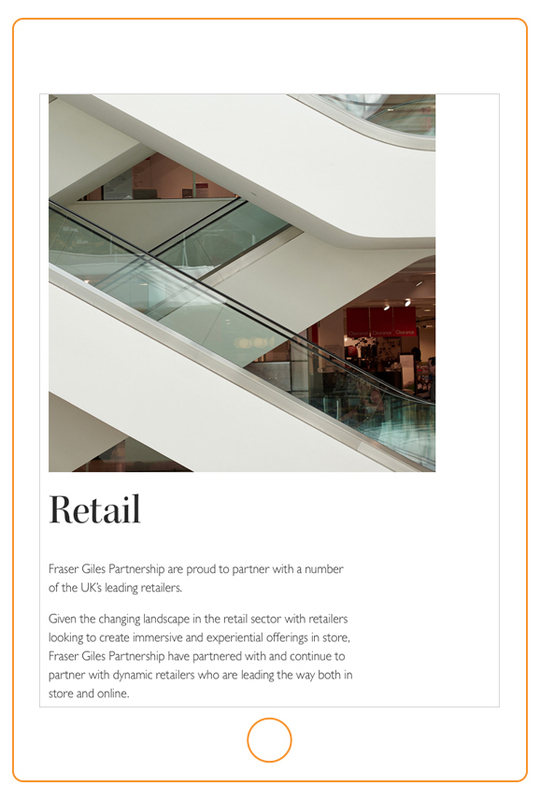 The new website is defined by a blend of the key business sectors that Fraser Giles cover with their unique approach to building relationships across borders and in many industries. It’s my belief that combining this way of branding a company with a fantastic set of visuals goes to the heart of what we do best. The end result is a fantastic corporate website that will set Fraser Giles up for the years to come, refreshing their visual appearance and allowing plenty of scope for growth for the future. COULD THIS APPROACH BE RIGHT FOR YOUR BUSINESS? If your branding could use a fresh approach, please give me a call on 020 7351 4083 or email direct.